Germany North of the Mayne. 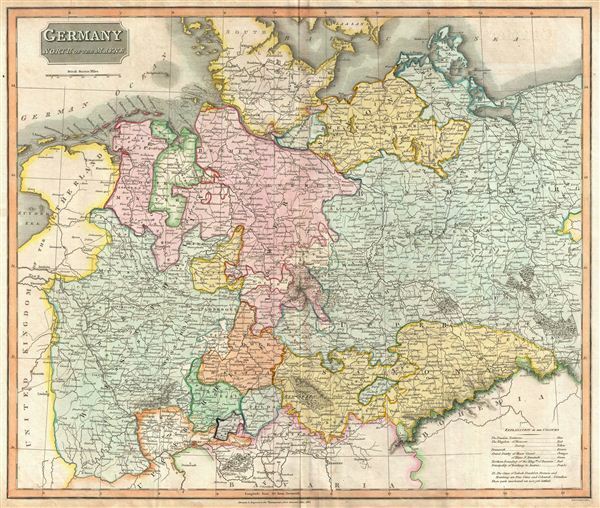 This fascinating hand colored 1816 map depicts the semi-autonomous kingdoms, duchies, and Prussian territories of northern Germany. These include Westphalia, Rhineland, Saxony, Brandenburg, Bremen, Munster, Pomerania, and others. Following the Napoleonic Wars, the Congress of Vienna reorganized the 39 sovereign states that formerly composed the defunct Holy Roman Empire into the loosely governed German Confederation. The whole is beautifully engraved in the minimalist English style pioneered in the early part of the 19th century. Thomson maps are known for their stunning color, awe inspiring size, and magnificent detail. Thomson's work, including this map, represents some of the finest cartographic art of the 19th century. Relief is shown by hachure with towns, cities, and major topographical features identified. Engraved in 1816 by Samuel Neele and issued as plate no. 20 in Edinburgh cartographer John Thomson's 1817 edition of the New General Atlas. Thomson, J. A New General Atlas, (Edinburgh) 1816. Rumsey 1007.019. Phillips (Atlases) 731. Newberry Library: Ayer 135 T4 1817.